Summer's a great time to have your home on the market. School's out and buyers want to move before the next school year begins. People are generally in a more relaxed frame of mind (goodbye, chilly weather, hello vacations). There are more daylight hours for people to view homes. And -- most beneficial for sellers -- homes just look brighter, cleaner and prettier in summer than in other seasons. If the look of your home from the curb hasn't changed since January, what are you waiting for? If it's advice to make the most of your summer staging, I've got that for you. 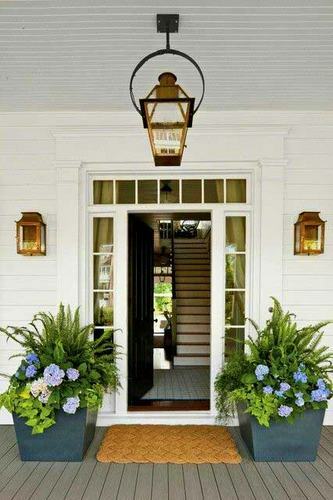 These photos and suggestions are bound to spark some ideas for staging your front door area. 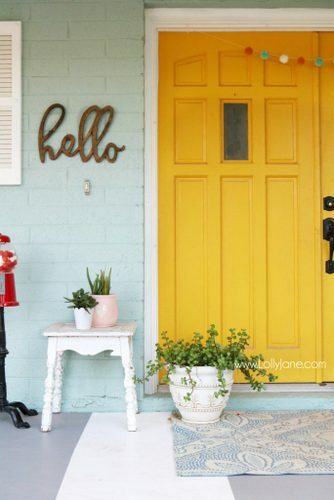 We hear so much about neutral colors for home staging, that we might not realize when it comes to exterior doors, the rules change. 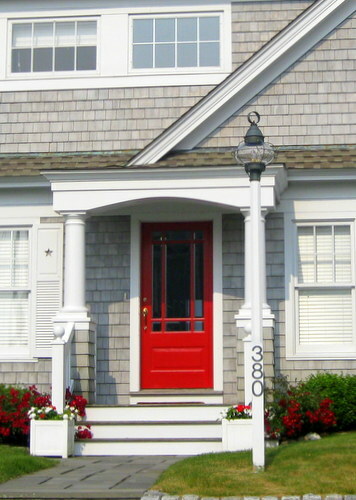 The red door on this shingled grey home above is a perfect example of how to make your entry stand out. 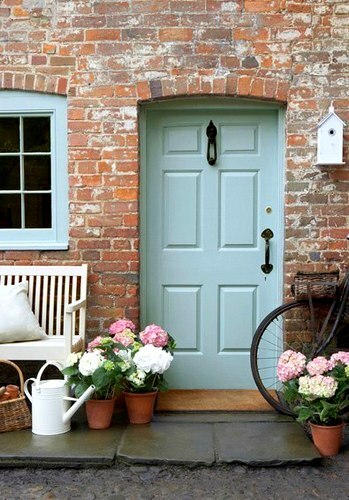 A front door doesn't have to be a bright, saturated color to be summery. Cool colors are especially appealing during warmer months. Even though there are decorative props clustered around this beautiful doorway, it doesn't feel crowded because everything is scaled pleasantly. Photo: French Bulldogs. 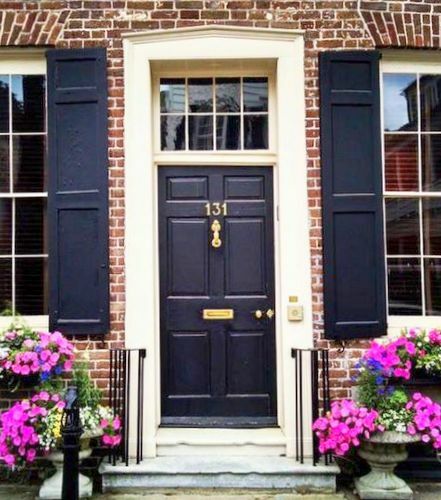 In Charleston's historic areas, homeowners paint trim like shutters and doors and ironwork with what's called "Charleston green." It's black, but with a hint of green. It's a beautiful background for whatever else you use to adorn your front steps and walkway. Photo: Southern Living. If it's plain old white, don't feel compelled to paint your front door. You can add some seasonal color and style with plants and a jumbo welcome mat. It's easy to care for container plants that are right outside your front door. If you're going to have flower pots, why not make them stand-out big and matching? For a formal house -- or to make your home look more formal -- nothing beats a pair, especially when both the pots and the plant selections match. Photo: Drive By Decor. Summer gives you the chance to play with plants that might not like your climate in winter. These giant elephant ear plants look quirky and dramatic. 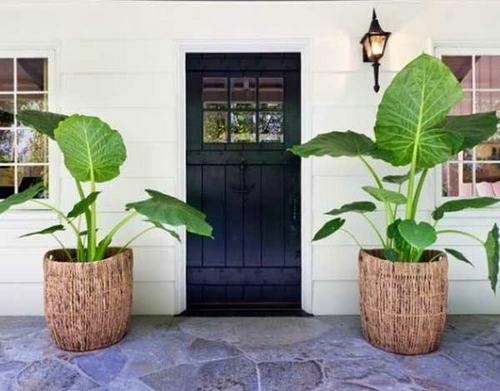 When a front door area doesn't get direct sun all day, shade-loving tropical plants like these are perfect candidates. Photo: Home Design Inspired. Artificial plants in containers look hokey, but no one expects you to have fresh flowers in a wreath for your door. 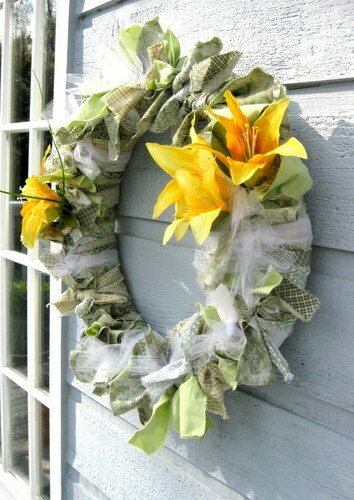 These silk daylilies complete a summery rag wreath that's quick, easy and cheap to make. 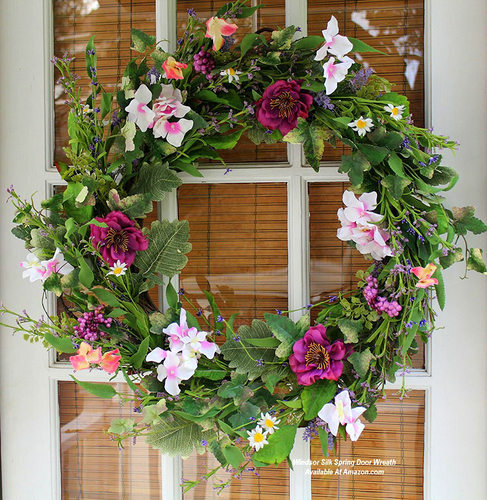 Even a small entrance or condo door can sport a wreath to celebrate the season and make a home feel tended. Remember that home buyers will be standing at the front door while their broker is unlocking it and they are already judging what the home is worth to them. Photo: Windsor Silks. Make it a regular habit to quickly sweep away dirt, cobwebs, pollen, and dust around your outside entrance. Clean homes sell faster. Even a small landing often has space for a chair or bench. Two chairs look especially friendly, but please arrange them to face each other at an angle that would be convenient for conversation. A small piece of furniture near the front door gives you a chance to make an impression. A wicker table or anything else that's made of wicker looks wonderfully summery. Your welcome mat is another chance to add a distinctive touch. Treat yourself (and prospective buyers) to a clean and colorful new one. They're so inexpensive! If your property is unoccupied, use exterior decorations that are not so valuable that they might be tempting to vandals and thieves. 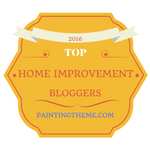 Is your porch, landing or steps needing a coat of paint? Is the door dented or faded? 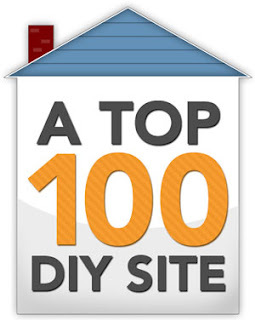 Deferred maintenance is a red flag to buyers. If you add flags or signs to your exterior staging, be certain they do not offend or alienate any prospective buyers. Nothing profane or in-your-face opinionated. If you have room for a bench or chair, set them out near your entrance. Match the furniture style to the architectural style of your home -- modern for a contemporary home, classic for a traditional house, some unique finds for a cottage, mid-century-modern for a ranch house, or rustic furnishings for a farmhouse, for example. Elevate your plants to give them importance and make them more noticeable both from the street and up close. Use a color scheme that unifies a grouping of various containers and plants. A little lightheartedness goes a long way towards befriending buyers. Show some personality outside your home by displaying a silly collection of garden art like these frogs, or some unusual containers for your plants, like vintage tinware, hypertufa, baskets, or wooden buckets. I hope you have some fun staging the entrance to your home on the market, and make it a pleasure and an enticement for people touring homes. Download my home staging eBook for more tips to help you sell your home fast!